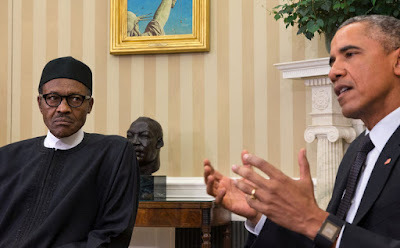 President Obama meeting with President Muhammadu Buhari of Nigeria in the Oval Office in July. Less than two years after it blocked a sale of American-made attack helicopters to Nigeria from Israel because of human rights concerns, the Obama administration says it is poised to sell up to 12 light attack aircraft to Nigeria as part of an effort to support the country’s fight against the Boko Haram militant group. But the pending sale of the Super Tucano attack warplanes — which would require congressional approval — is already coming under criticism from human rights organizations that say President Muhammadu Buhari of Nigeria has not yet done enough to stop the abuses and corruption that flourished in the military under his predecessor, Goodluck Jonathan, New York Times reports. Officials at the White House, the State Department and the Pentagon have been bracing for a fight with congressional Democrats, in particular Senator Patrick J. Leahy of Vermont, over the sale of the planes. The proposed sale reflects the warming of the relationship between the Nigerian and American militaries, which had frayed under Mr. Jonathan. The Pentagon often bypassed Nigeria in the fight against Boko Haram, choosing to work directly with neighboring Cameroon, Chad and Niger. In addition to citing corruption and sweeping human rights abuses by Nigerian soldiers, American officials were hesitant to share intelligence with the Nigerian military, saying Boko Haram had infiltrated it. That accusation prompted indignation from Nigeria. But that was before Mr. Buhari, a former Nigerian Army major general, defeated Mr. Jonathan in an election last year. Since coming into power, Mr. Buhari has devoted himself to rooting out graft in Africa’s largest economy. He has fired a number of Nigerian military officers accused of corruption, and American military officials say they are now working closely with some of their counterparts in Nigeria. The Obama administration is also considering sending dozens of Special Operations advisers to the front lines of Nigeria’s fight against Boko Haram, an insurgency that has killed thousands of civilians in the country’s northeast as well as in Cameroon, Chad and Niger. Mr. Buhari has also pledged to investigate allegations of human rights abuses and has said he will not tolerate them. A move to sell the Super Tucano attack aircraft to Nigeria, first reported by Reuters, would continue the détente between the two militaries, administration officials said. The Super Tucano, a turboprop aircraft, is designed for light attack, counterinsurgency, close air support and reconnaissance missions. It could prove useful as the Nigerian military tries to clear Boko Haram out of the Sambisa Forest, which is believed to hold large numbers of the militants, as well as kidnapped girls and women. The administration has not made a formal decision to send a notification to Congress, but a senior administration official said he expected one soon. President Obama is considering a trip to Nigeria in July. But already aides to Mr. Leahy, a sponsor of a human rights law that prohibits the State Department and Pentagon from providing military assistance to foreign militaries with poor human rights records, have expressed concern. “We don’t have confidence in the Nigerians’ ability to use them in a manner that complies with the laws of war and doesn’t end up disproportionately harming civilians, nor in the capability of the U.S. government to monitor their use,” said Tim Rieser, a top Leahy aide. Gen. Mark A. Milley, the Army chief of staff, is attending a meeting of top African military officials, including from Nigeria, here in Arusha this week. Aboard his flight on Saturday, General Milley declined to comment on whether Nigeria’s human rights record had improved enough to warrant the sale, but said one of the reasons he was attending the meeting was to learn more about the African militaries with which the Pentagon is working. Consideration of selling the attack aircraft to Nigeria is a sharp turnabout from two years ago, when the United States blocked the sale of American-made Cobra attack helicopters to Nigeria from Israel, amid concerns about Nigeria’s protection of civilians when conducting military operations. That infuriated the Nigerian government, and Nigeria’s ambassador to the United States responded sharply, accusing Washington of hampering the effort against Boko Haram. The report said 149 people had died this year in detention in the Nigerian military’s Giwa barracks in Maiduguri, a city that has been a staging ground for the fight against Boko Haram. Among the victims were 11 children under age 6, including four infants, Amnesty said. The prisoners most likely died of disease, starvation, dehydration or gunshot wounds, the report said. Sarah Margon, the Washington director at Human Rights Watch, disagreed.